This project is one of those things I’ve wanted to do for a while. My table saw is small, and you can only rip something about 11 inches wide. It always seemes to me that I need to rip something 12 inches wide. Since my router table is one of those store bought bench top types, I decided to incorporate the router table cabinet into the table saw and kill two birds with one stone. The cabinet itself much resembles the two I made for my drill press and band saw. They all bear a family resemblance in design and paint scheme. The router cabinet needed to house the router and have 3 drawers for storage. (You can never have too much storage.) 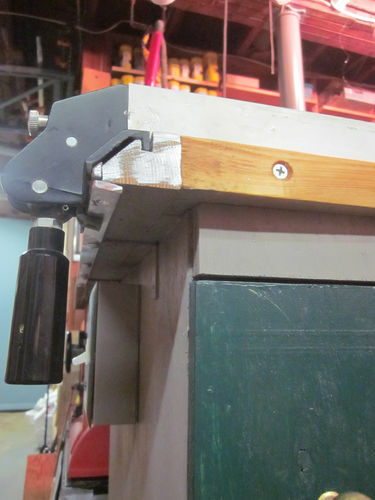 My fence clamps to my table saw fence and has a vacuum port in it. I’m hoping to incorporate a dedicated shop vac under my table saw soon. The cabinet itself is wired with an outlet and a switch which is handy for both the TS and the router. A large door allows me to easily access the height adjustment, especially if I just need to lower the bit. The router and base plate lift right out to make changing bits a breeze and I’ve hung the wrench for that job on the side of the cabinet. The top drawer is more than big enough to hold the bits I currently own. Time to buy more bits. Instead of making the fence movable, I decided to create a removable face plate on the fence. This allows me to make the gap exactly as big as I need, or just leave the blank one in place. I also made collars for around the cutting bit. They are held in place with rare earth magnets. The smallest one is a blank to keep sawdust out of the router when not in use. Even though this is not as large as the typical router table, I think it is a good upgrade. 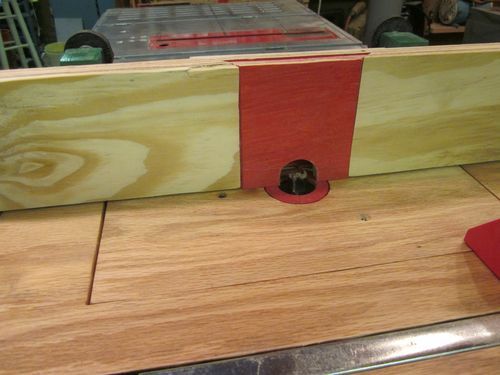 I also have an idea of building a scroll saw from one of my spare jig saws. I can design it to mount in the rectangle where the router base plate now sits. Nice! Looks Like a really sturdy table. Thanks Izzy. For my next trick, I’m going to make it and the table saw mobile as a unit. Sometimes I need to pull it out into the room further. Another great cabinet Dave! Should serve you well. Thanks for sharing. Nice, very nice. I especially like how the angles on the under piece of plywood cradle the corners of the upper piece the router is actually attached to. I can use that idea in so many ways. How did you get the angled part on the front of the table that the rip fence attaches to? It seems to be very specific to the rip fence and not something I would pick up at the hardware store. I am missing something? I usually do. The rip fence shape is a separate piece attached to the edge of the table with glue and angle brackets. It started out as a length of 2×2 on which I first ripped a kerf, then ripped a 45 degree angle. 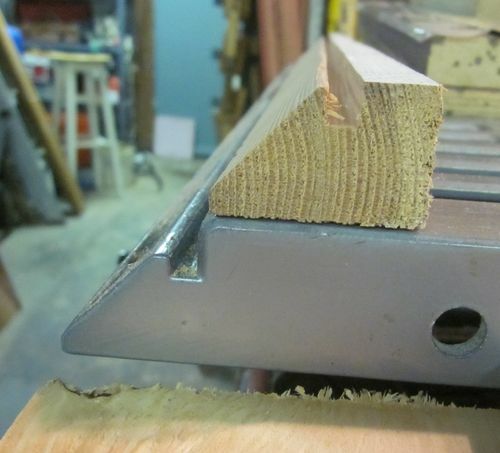 I tool the angle off the table saw edge. While it matches very well, it’s not super critical. 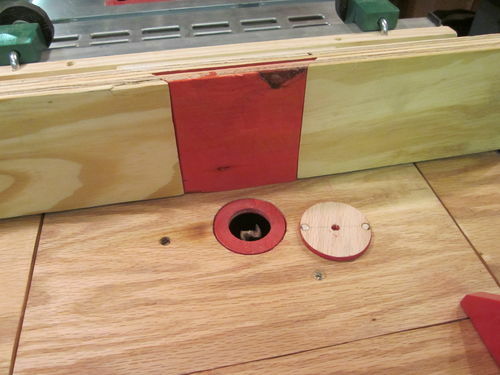 The rip fence for the table saw only grabs the bottom edge, so it’s really a matter of removing anything else that interferes with the guide for the rip fence. It’s not a perfect solution, but it is usable. I like to think I was prepared for this by trying to convince small printing presses that they were more than they were meant to be. Even wow-er. The front of the table looks like metal. That angled part is wood painted like metal? I think I see a strip of metal under the edge. I would have never thought of doing something like that. Thank you very much. Matter of fact, if you posted more pictures of that part I would really appreciate it. nomercadies, It’s painted with silver paint. I didn’t want it to be gray or white, so I dug out a bottle of Testors silver. The whole thing had some luck to it. I had to put a length of bar metal (aluminum) on the top to bring the top even with the table top. 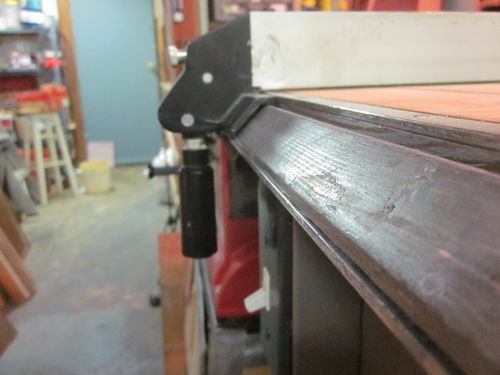 The rip fence clamp worked without the bar metal underneath, but it wasn’t tight as it was on the table saw, so I added the length underneath. It’s all ‘permanent until further notice’. If it doesn’t hold up, I may do something different eventually. Maybe these pix are what you want. Great addition to the shop Dave. 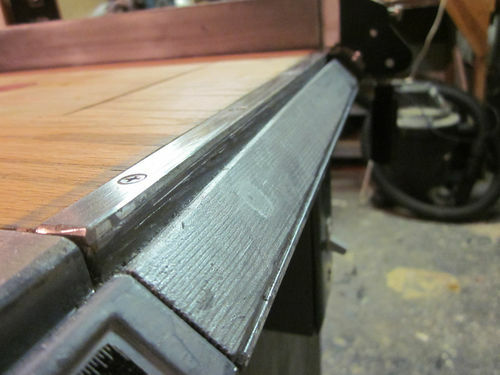 I inspires me to put an addition on my table saw. Creative. I like how you made the fence rail out of lumber. What was once two small table sites is now ONE usable dual purpose table. Nice job ! I’m so impressed. I think you did something for everybody. I hope lots of people see this. canadianchips, Somewhere down the road I’ll be making it more than dual purpose. It’ll be a while though. There are other things on my list. You are slowly getting it all together and I see some big improvements . Looks good and I am waiting for your next solutions . I have the exact same saw and have been meaning to do this too. How bout you sell me youren, and make you anutterern? Just kidding, but this has been an inspiration. I gotta get me to the shop now. Thanks for showing.